Do you want to add a custom dashboard logo in WordPress? Often people replace WordPress logo with a custom dashboard logo for branding purposes. In this article, we will show you how to add a custom dashboard logo in WordPress for branding. This method is easier and recommended for most beginners. Next, you need to click on ‘Yes’ to hide the WordPress logo and then upload your own custom logo. The custom logo should be exactly 16 x 16 pixels in dimensions. 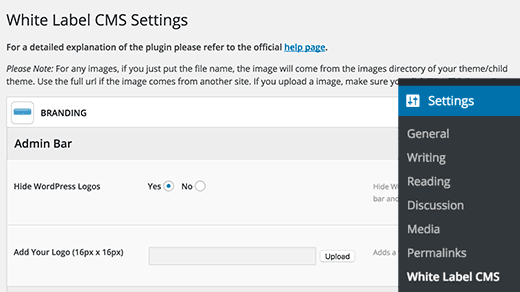 Aside from custom dashboard logo, White Label CMS also offers other features to rebrand your WordPress installation. See our guide on how to white label the WordPress admin dashboard for detailed instructions. This method is for users who are comfortable pasting code snippets in WordPress. First you need to save your custom logo as custom-logo.png file on your computer. It needs to be exactly 16 x 16px in dimensions. Once you have your custom logo ready, you need to upload it to /wp-content/themes/your-theme/images folder using FTP. If your theme does not have an images folder, then you need to create it. After uploading you custom logo image, simply add this code to your theme’s functions.php file or a site-specific plugin. This code simply adds CSS required to display your custom logo in the WordPress admin bar. That’s all we hope this article helped you learn how to add a custom dashboard logo in WordPress for branding. You may also want to see our guide on how how to hide unnecessary items from WordPress with Adminimize. I mean, the logo itself must be a png (transparent picture) of the WP-logo, placed somewhere in WP. So, would it not be better to just switch that with another file with the same name? This does’nt wok for me. I made the 16×16 png and put it in my themes images folder and pasted the function to my functions.php file. change the file path to your image path. A great article information with some great tips sharing that I will be implementing on my own website as well as clients.